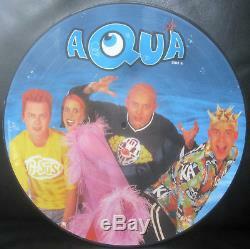 This item is a mint condition, never opened 12" picture disc of Denmark's Aqua "Aquarium [UMT -85020] from 1997 on Universal Records. This is an highly sought import from Denmark. The disc comes in a soft clear vinyl sleeve. The LP has never been played. Please keep in mind that picture discs are not made for their sound quality since they are pressed on heavier vinyl to hold the graphics. This is a cool and very rare collectible for collectors and Pop Dance fans alike. I have seen this picture disc sell at twice the listed price here. Check out my other items. Unless noted, all of my vinyl LP/12 are mint condition items that have never been played. They have been stored on their side in crates in temperature controlled rooms since release. Make sure to check out the doctors E-Bay store, Dr. New Stuff is always coming in, so bookmark the store. Might see something ya like! 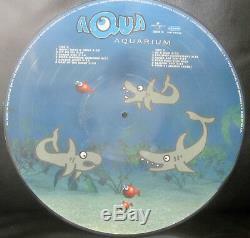 The item "Aqua AQUARIUM 1997 12 Vinyl Picture Disc Mint + Very Rare" is in sale since Tuesday, May 8, 2018. This item is in the category "Music\Records". The seller is "drtong" and is located in Charlotte, North Carolina. This item can be shipped worldwide.